In August 1905 two gold-mining brothers, Robert and Thomas Swan, discovered hot springs about 60 miles northeast of Fairbanks, Alaska. Looking for a place to ease the pain of rheumatism, Robert and his brother set out by boat on the Chena River in search of the source of steam reported rising from a valley by a U.S. Geological Survey crew in 1904. 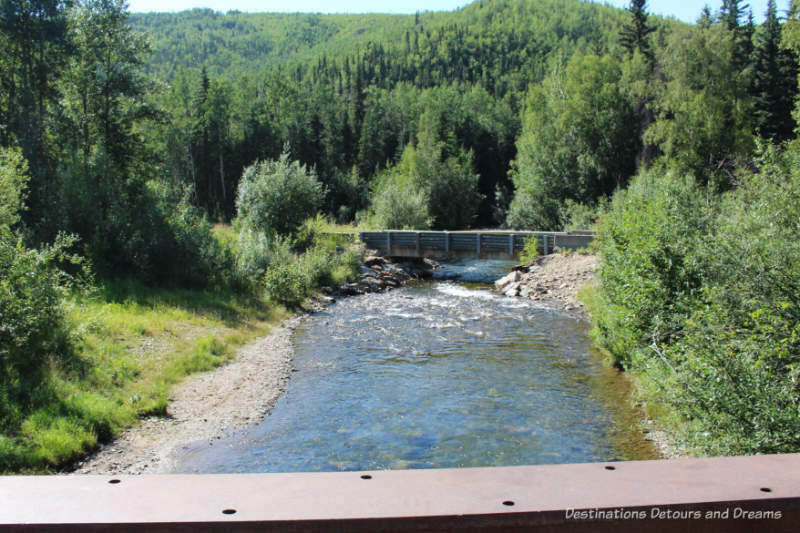 They found the hot springs along Monument Creek, a short way from where the creek joined the Chena River. By 1911, the property boasted a stable, a boathouse and twelve small cabins for visitors. 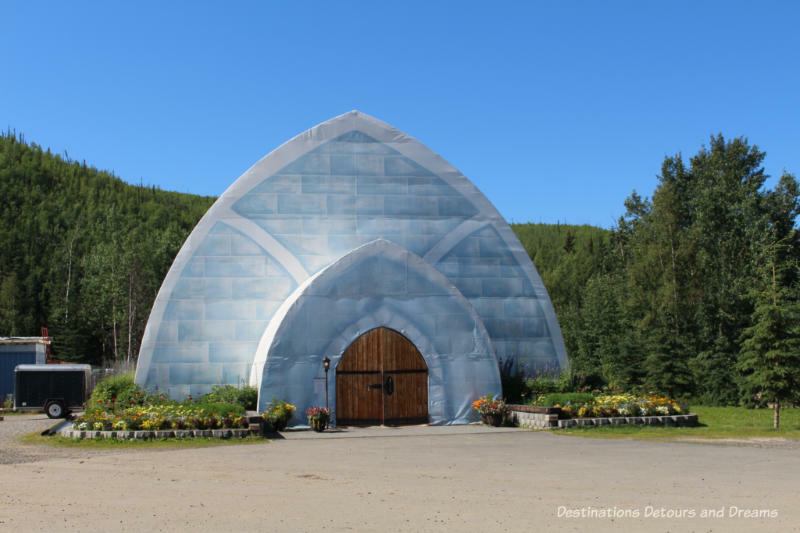 Today, Chena Hot Springs is a year-round resort with 80 rooms as well as RV and camping spots, yurts, and several “dry” cabins (no bathrooms or running water, outhouses only). Set amidst a treed landscape of birch, cottonwood and spruce, and surrounded by forested hills, the resort offers a range of activities in addition to the hot waters. 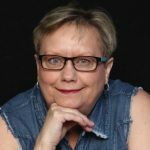 I had the opportunity to spend a night at Chena Hot Springs during a summer visit to Fairbanks, Alaska and participate in some of those activities. We stayed in one of the spacious Moose Lodge rooms. Note that wifi access is available at the resort for a daily fee. The hot springs water, which contains sulfate, chloride and bicarbonate of sodium among other minerals, is very similar to waters of a famous hot springs in Bohemia. Today guests can experience the supposedly curative powers of the water in the outdoor springs lake. Average depth is around four feet, but varies from day to day. It appeared to be a bit deeper than that in most places when I visited. Average temperature is 106 degrees Fahrenheit. It is not chlorinated. Natural flow in and out of the springs creates circulation and natural filtration. It is drained weekly, cleaned and refilled. The lake is adults-only. In a pool house beside the springs lake, there is also a family salt water pool and chlorinated hot tubs. One of the activities offered at Chena Hot Springs is a tour of the geothermal plant. Chena Hot Springs Resort is thirty miles from the nearest electric grid and maintains its own generators. In 2006, it installed Alaska’s first geothermal energy plant using innovative technology to produce geothermal energy at lower temperatures. 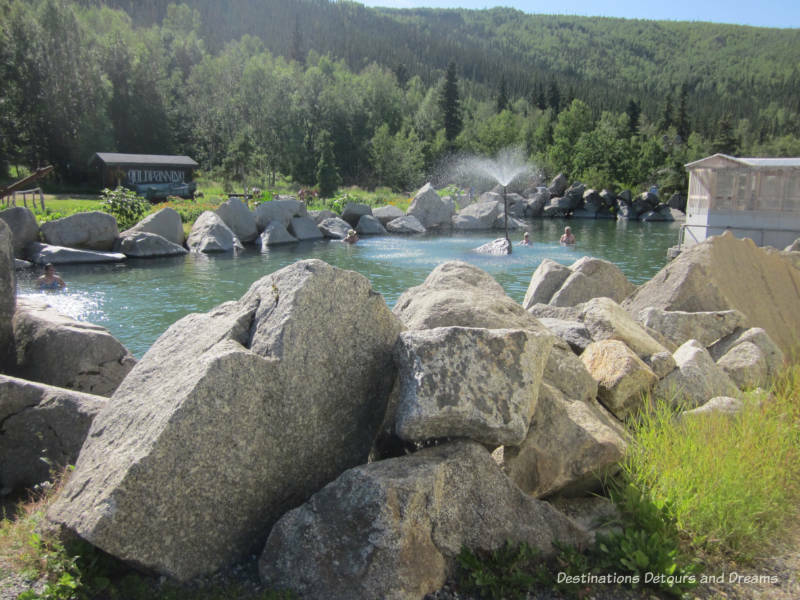 Chena Hot Springs are one of approximately thirty hot springs found in a 2,000 mile-long thermal belt extending from the Seward Peninsula to the Yukon Territory in Canada. The majority of the thermal springs along this trend are low- to moderate-temperature systems. 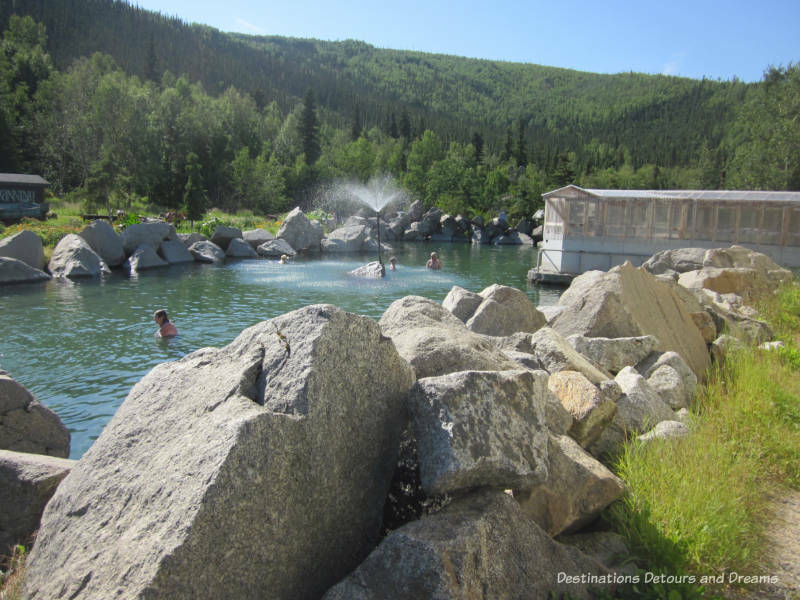 The waters at Chena Hot Springs never reach above 165°F. Traditional steam-driven turbines require temperatures of 220°F. A secondary fluid, R-143a, which has a lower boiling point than water passes through a heat exchanger with geothermal water from the wells. The heat from the water causes the R-134a fluid to flash to vapor and drive the turbines. If you are interested in reading more about the engineering and mechanics of this, read this article. Or this article in Popular Mechanics. In 2017, Chena Hot Springs Resort installed a larger, second geothermal power station. 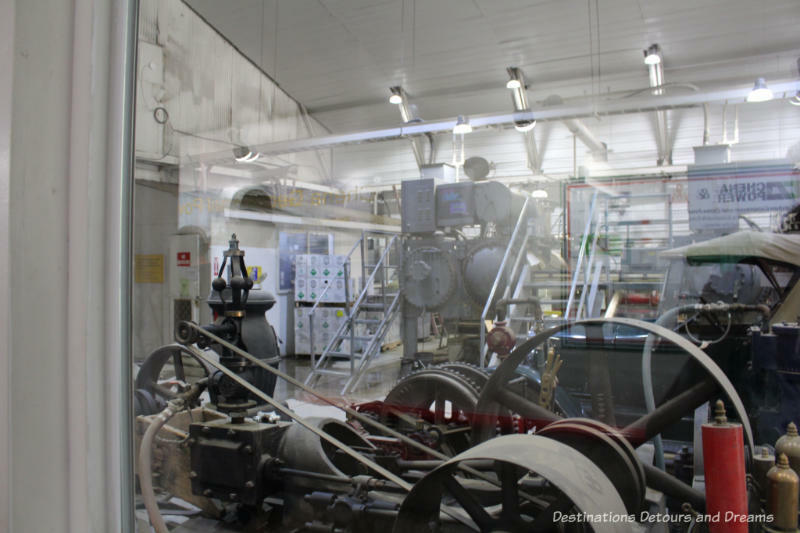 When I toured the plant in summer of 2018, the second geothermal station was not fully operational, although it had run for short periods of testing time. The expectation was that it would operate in full by winter 2018 and that all the resort’s power needs would then be met by the two geothermal engines, relegating their other generators to solely a back-up role. The resort grows vegetables in its gardens in summer. 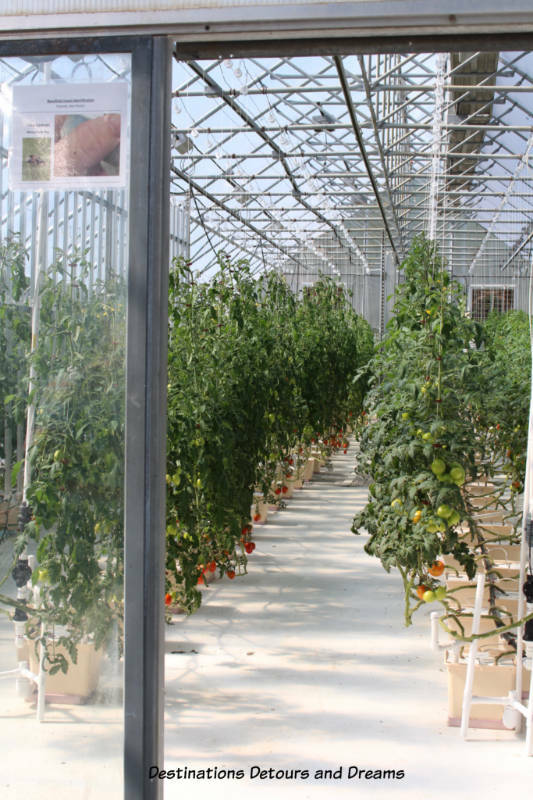 It also has two greenhouses, powered by geothermal power. One provides fresh lettuce year-round. The other provides fresh tomatoes ten months of the year. Even additional lighting and warmth is not powerful enough to counteract the winter darkness for the remaining two months. 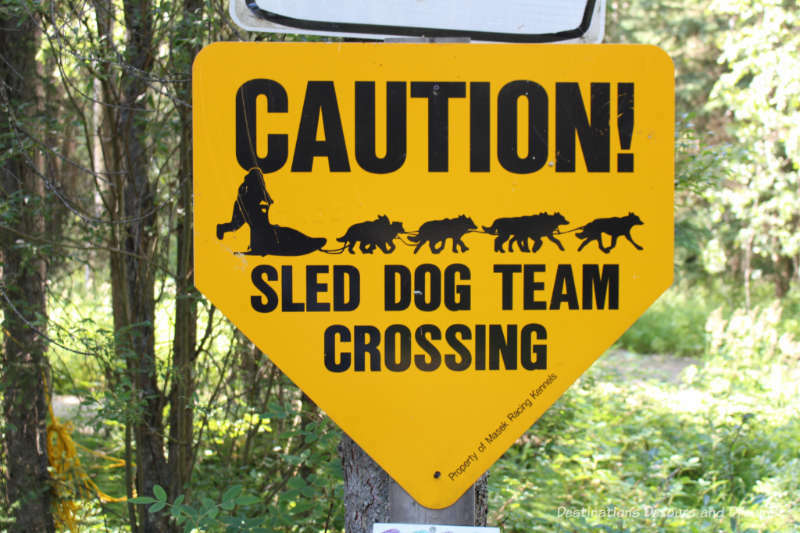 Dog mushing is Alaska’s official sport. 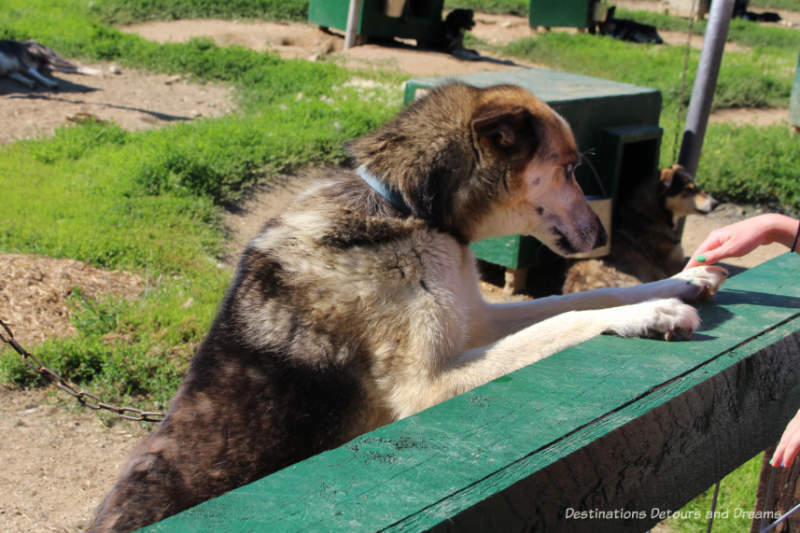 The Chena Hot Springs Kennel houses 100 Alaskan-bred dogs and offers a year round dog sledding experience. On tours of the kennel, you learn about the sport of dog mushing. There are two major annual dog sled races in Alaska. 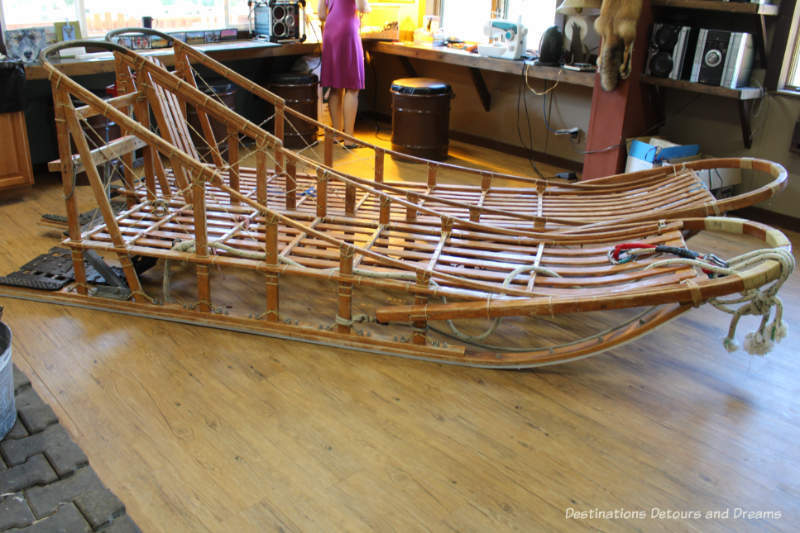 The Iditarod runs for about a thousand miles from Anchorage to Nome. The Yukon Quest, which is considered to be the most difficult dogsled race in the world, runs between Fairbanks and Whitehorse, Yukon in Canada and alternates direction each year. When staff explained what was involved, I was struck by how much work the mushers have to put in to care for the dogs. Even when they stop for the night, the musher has hours of work to feed and look after the dogs. He/she doesn’t get much sleep. 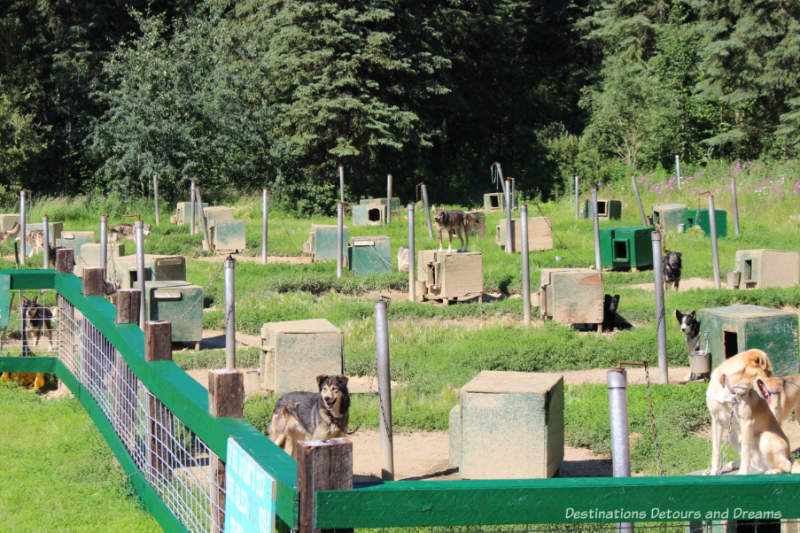 The Chena Hot Springs Kennel is a touring, non-competitive kennel that “employs” mostly rescue dogs. 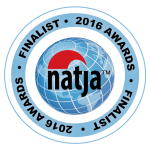 They get their dogs from sled-dog rescue organizations, the animal shelter and other mushing kennels. They no longer breed dogs. There are several different roles on a dog sled team. Breeders and kennels watch puppies for characteristics that make them most suited to a particular role. The rescue dogs at Chena Hot Springs Kennel are generally no longer puppies when they arrive at the kennel and their roles are already established. During the winter, dog sled rides are available. After the snow melts, the Kennel offers dog cart rides, unless it is too hot to work the dogs, as was the case when I visited in July. 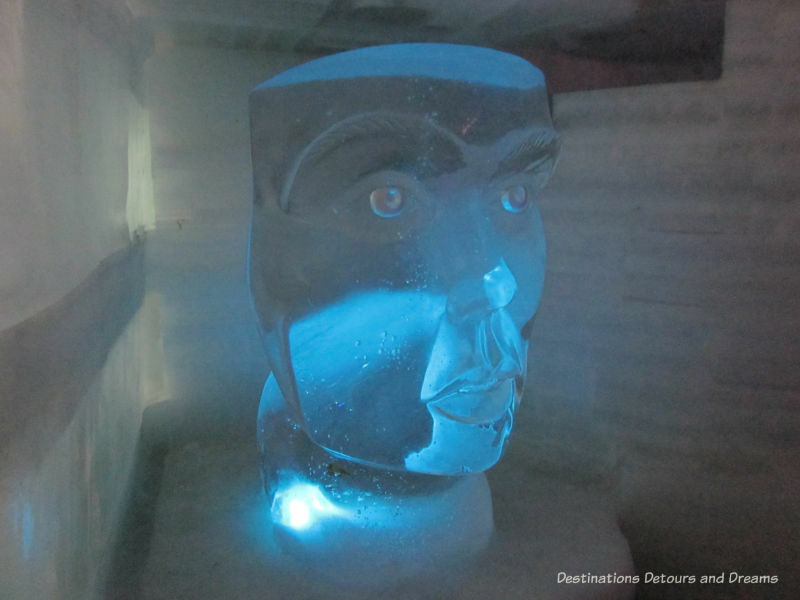 The Aurora Ice Museum is the most unusual attraction at Chena Hot Springs. Walls and floors and everything inside the museum are made of ice. The museum is illuminated with coloured lighting and kept frozen all year round. 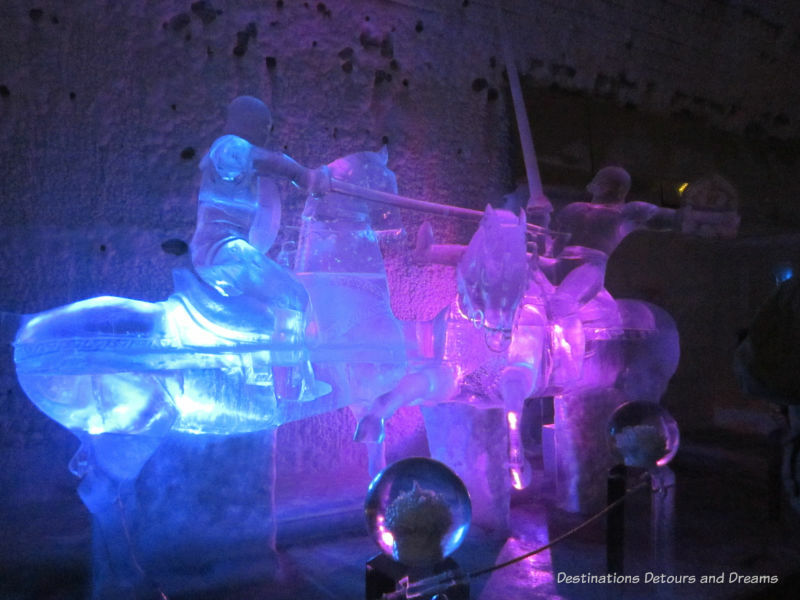 It features ice sculptures by champion ice carvers Steve and Heather Brice. The museum is maintained at a temperature of 25°F (-7°C) all year (which means that at times during the winter it may be warmer inside the ice museum than outside it). Entrance is via group tours. 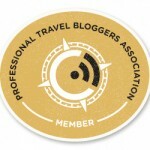 You are provided with a parka prior to entering. 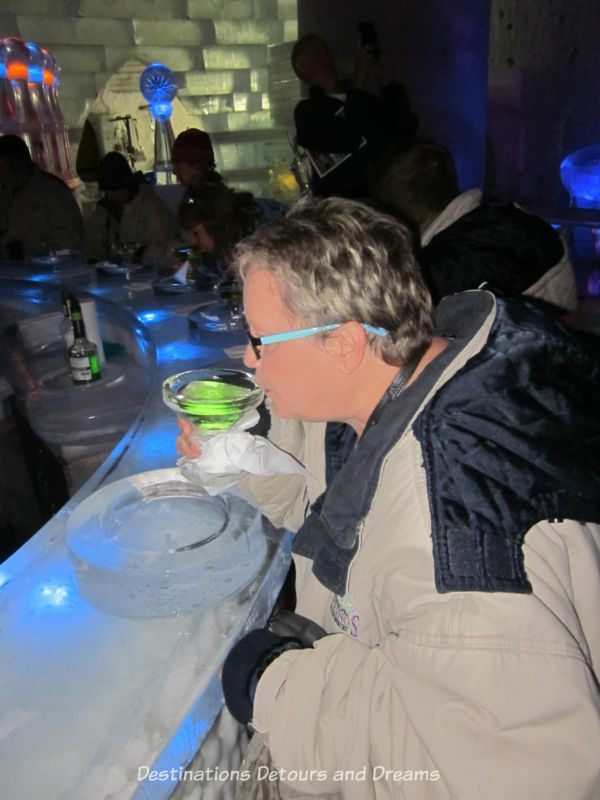 The museum’s signature beverage, the Appletini, is served in an ice-carved martini glass, which I found too cold to hold with bare hands. The bar and bar stools are made of ice. Stools are covered in caribou fur. You get to keep the glass, which won’t last long in summer once outside the museum. 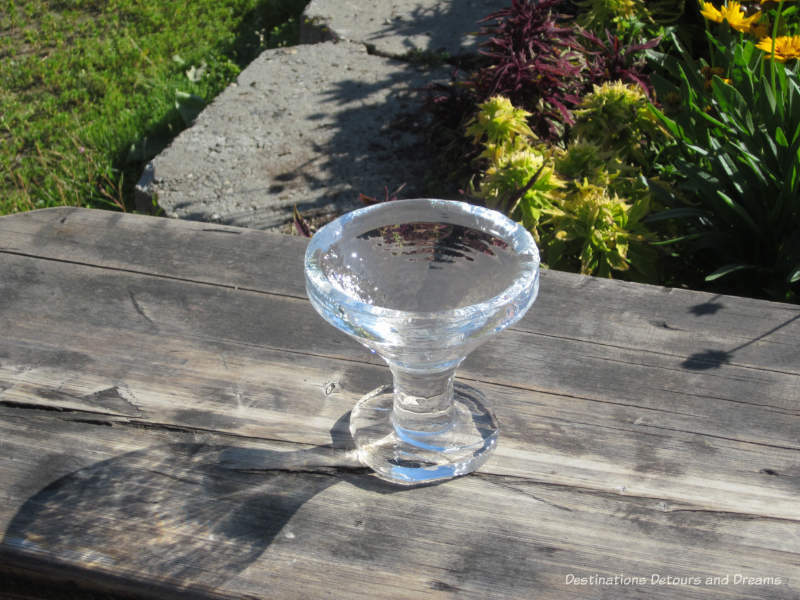 My husband heard that it was a tradition to throw the glass high in the air and let it shatter when it fell to the ground. The bits of ice would soon melt on the gravel parking lot, but it still felt irresponsible to leave behind what looked like broken bits of glass. 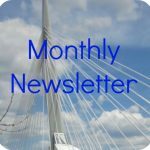 Other summer activities include hiking, bike rentals, ATV tours, horseback riding and canoe rentals. Winter activities include cross-country skiing, snowshoeing, skating, snowmobile rides and aurora viewing coach tours. Massage treatments are available year-round. The geothermal tour is free, but all other activities have a charge, including the hot springs/pool. 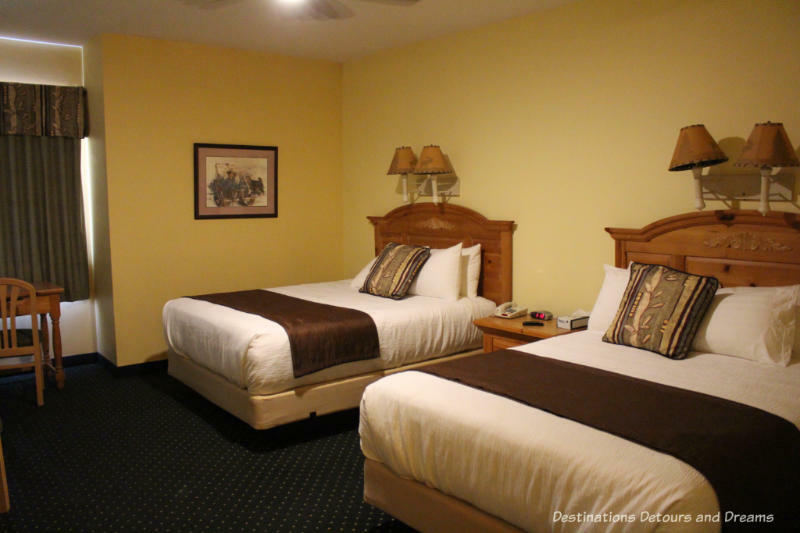 Unlimited swim/soak passes are included in room stays. You do not need to be staying at the resort to use the hot springs, pool, activities and restaurant. The Aurora Café inside the Activity Center, which is where you book your tours and activities, offers snacks, hot soup, salads, sandwiches and ice cream treats. 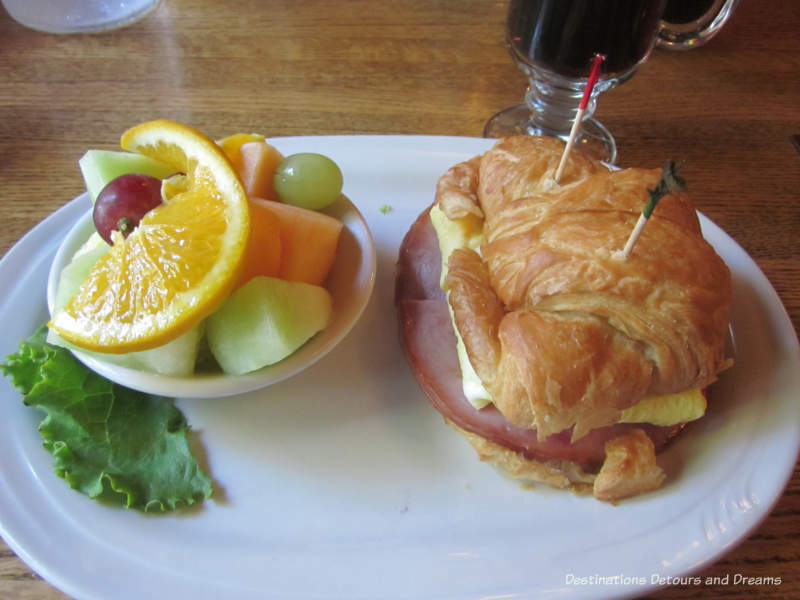 The Chena Hot Springs restaurant serves breakfast, lunch and dinner daily. 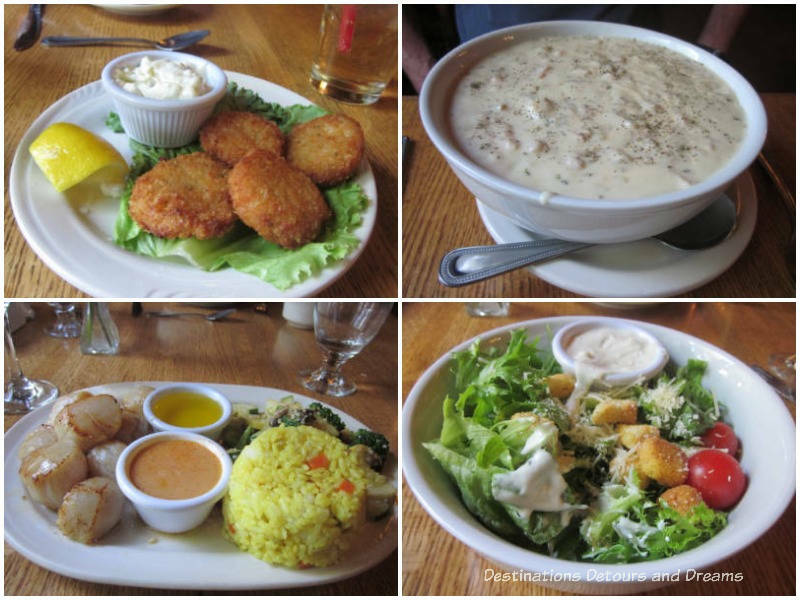 It features lettuce, tomatoes, peppers, cucumbers and herbs from their own gardens and greenhouse, as well as Alaskan produce and seafood from elsewhere in the state. 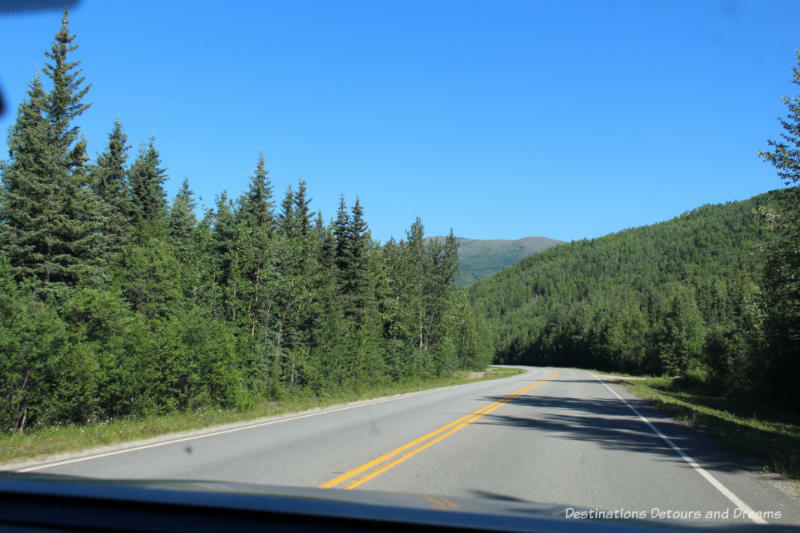 Forest-lined on either side, the drive is scenic. Watch for wildlife. 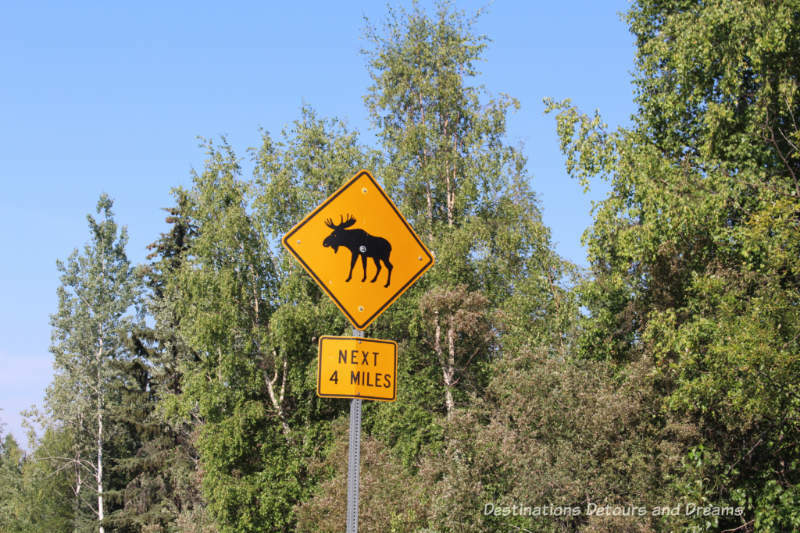 We passed several signs warning us to watch for moose, but we never saw a moose. We also passed a few dogsled crossing signs. The road is open all year, but I’d be wary about driving it in winter if you aren’t used to winter driving conditions. The road is unlit. With less than four hours of daylight in the middle of winter, you’d need to carefully time your trip for the middle of the day to avoid driving in the dark. You can still get to the resort even if you’d rather not drive. 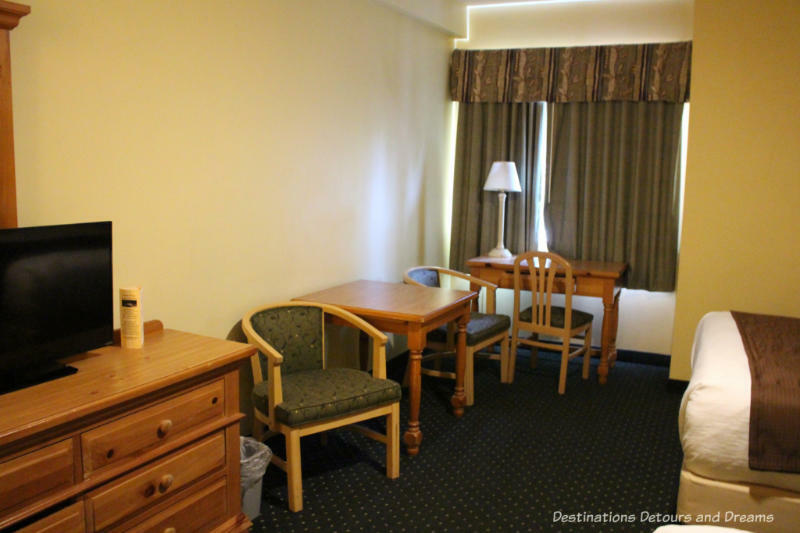 The resort offers a shuttle service for guests staying at the resort and can pick you up at the airport or a Fairbanks hotel. Round trip transportation will cost you $125 to $195 a person depending on the number of passengers and needs to be booked 72 hours in advance. 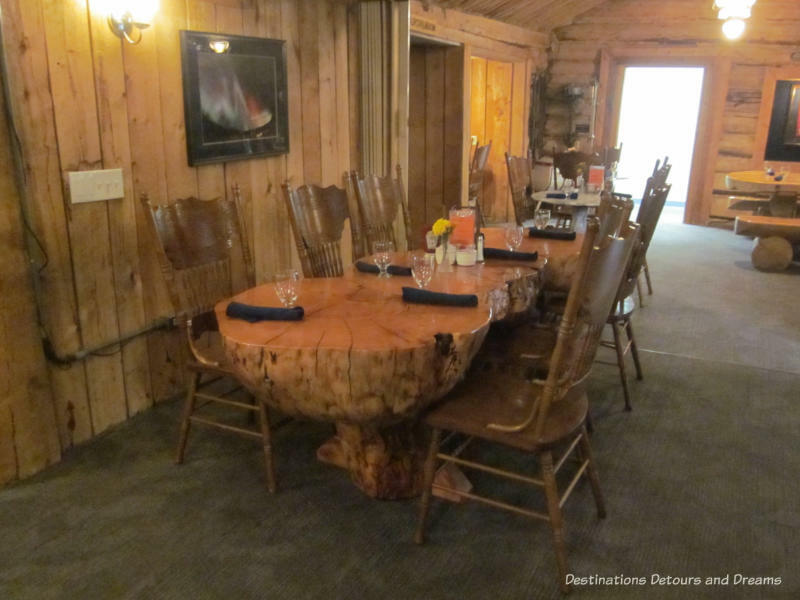 Regardless of the time of year or how you get there, it is worth considering adding time at Chena Hot Springs Resort to your Fairbanks itinerary. I enjoyed both the drive to the resort and my time at the resort. 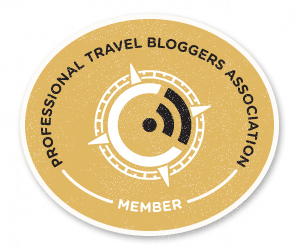 Imagine trekking through Alaska during a gold rush, likely on the verge of having body parts fall off from frostbite and suddenly…a hot spring! Must have seemed like heaven. Ken, I had looked at the hot spring from that perspective but you’re right – it must have seemed like heaven. 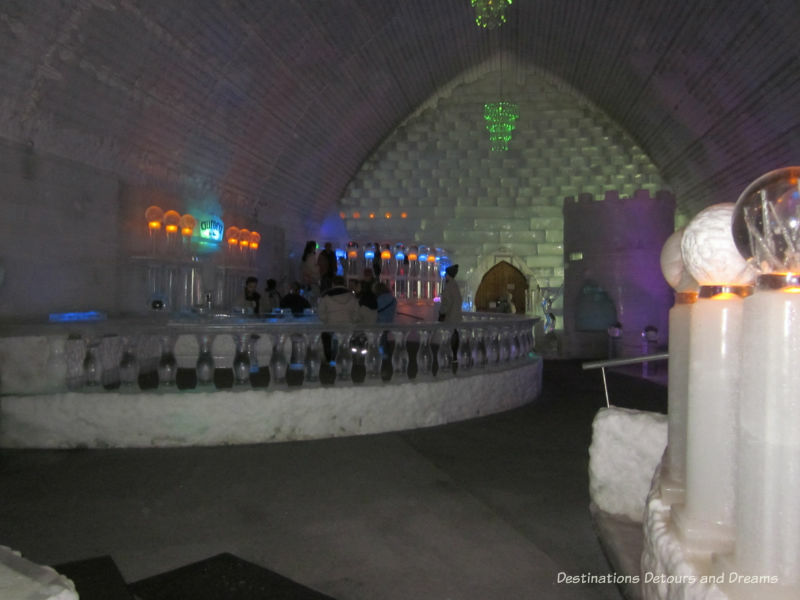 Appreciated this interesting post – Aurora Ice Museum looks really cool.